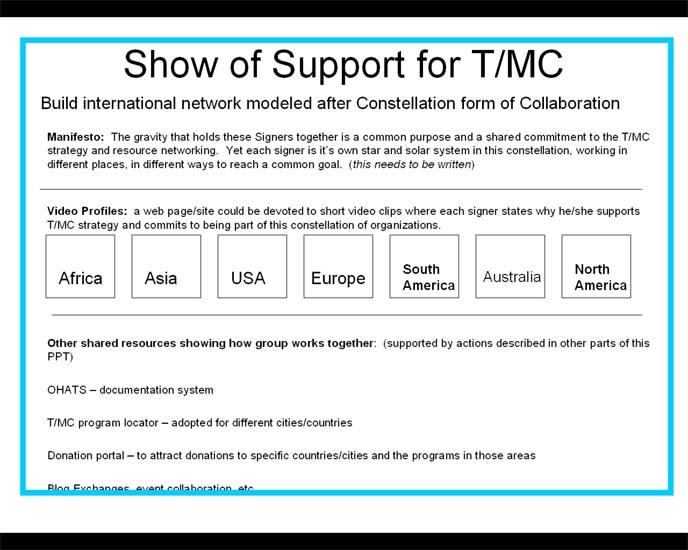 The chart below illustrates that people from around the world link to the T/MC web site, participate in forums are host groups where Dan Bassill has actively shared information and ideas for many years. If this were a web page, you should be able to click into the Africa or Asia section and see a chart like this, but showing names/faces of people who are helping. There could even be a link to a video and/or a blog where the person talks about why he/she is involved with the Tutor/Mentor Institute and Tutor/Mentor Connection. The chart below illustrates this differently. We want people to not only support us through the network, but we want people who actively work to make the ideas we share work in Chicago and in other communities. People might sign a manefisto showing their commitment. They might also become a recorder in OHATS to show this commitment and document their actions. This concept map illustrates this and provides a potential way to implement the idea. This map shows 2011 actual support. My goal is to create a web page that implements these graphic ideas and can collect investment payments and show names, profiles, endorsements, etc. I think we also need to build in an "advertising" page. I've been contacted in the past by people who want to advertise on our site but I've no experience in setting this up in a way that it does not deter from the site's mission, or link us with affiliations that we don't want. This document is a draft that can be used to invite members to join. How to motivate people to donate/invest? A few years ago we created a "cool cash" graphic to market a program to motivate our teens to visit our web sites each week. They would earn $1 or $2 Cool Cash dollars for each review they wrote. Can we create a graphic that looks like a dollar bill, with the Tutor/Mentor Institute logo in the middle, which can become a widget people who donate at different levels can put on their web sites with a link back to our recognition page? NationBuilder.com - this site could be integrated with the Tutor/Mentor Institute site to build a nation of support for our efforts. There is a monthly fee but it seems to have many built-int features that we'd need to create with much greater cost. Movements.org - Movements.org has leveraged its relationships with exciting movements in civil society to bring together some of the globe’s top technology and communications companies to share their knowledge and expertise with online activists from across the world. Social Change Collaboratory - Looks like they seek funding, too. The Churchill Club - Victoria's largest community of technologists, entrepreneurs & innovators, whom share ideas, wisdom and experiences. Storytellers for good - Storytellers for Good is a team of passionate journalists and photographers who seek to use their skills to inspire optimism and change. We aim to tell and promote stories of people and organizations making a positive difference. This is an on-line petition hosting site. Could something like this be used with the T/MC invitation above to gain members and signatures?